By all accounts, this was supposed to be something of a rebuilding year for both the Baylor men's and women's basketball programs. 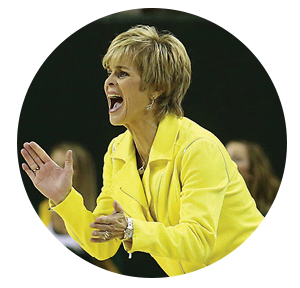 Kim Mulkey had lost a three-time All-American in each of the previous two seasons, gone through a total roster makeover since the 40-0 national champs in 2012 and was having to replace Odyssey Sims' 30 points per night. Scott Drew had maybe an even tougher task, losing his frontline of 7-1 center Isaiah Austin and 6-9 forward Cory Jefferson and Canadian sharpshooter Brady Heslip. Plus, he would have to beat the odds of a jinx that had seen the Bears never make the NCAA Tournament in an odd year in the 108-year history of the program. There were doubts everywhere, "probably even on campus," said junior forward Taurean Prince. While the women weren't given the nod to win the Big 12 title they had owned for four years, the men were picked to finish tied for sixth in the league and had all of one vote in the preseason Associated Press top-25 poll. "We like when people doubt us," said senior point guard Kenny Chery. Defying the odds and prognostications, the Lady Bears swept their fifth consecutive Big 12 regular-season and tournament championships, made their fifth Elite Eight in six years and finished 33-4; and the men finished 24-10 and made back-to-back NCAA Tournament appearances for the first time in school history. 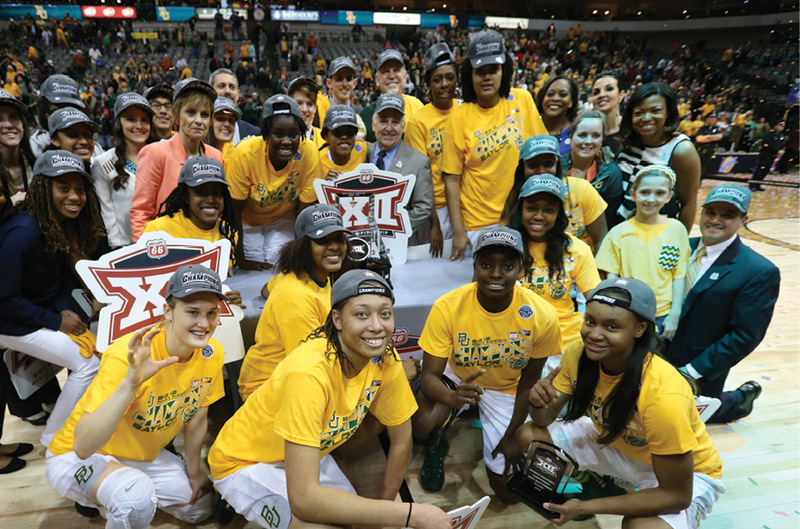 "What makes this particular team special is because the expectations were not to be an Elite Eight team," Mulkey said. "This team is just better than a lot of people thought. And I now know it, too." Not that it took the Big 12 titles to validate Mulkey's feelings, or even going toe-to-toe with Notre Dame in a 77-68 region final at Oklahoma City. "It didn’t take today's game to show me that," Mulkey said after losing to Notre Dame for the second straight year. "I figured that out midway through the Big 12 season when we were putting ourselves in a position to win it. I realized this team is going to be OK."
The Lady Bears embraced the underdog role. "We took that as a challenge," freshman guard Kristy Wallace said. "I'm glad we were able to get out there and show what we could do. We made it to the Elite Eight; no one ever thought we could. Credit to our fans for always being there, they believed in us." After losing Sims, the No. 2 pick overall in last year's WNBA Draft, the expectations for this team were about as low as they've been since maybe the 2003 team that didn't make the NCAA Tournament. But sophomore forward Nina Davis answered any questions about where the points were going to come from, averaging a Big 12- leading 21.1 points. Named a unanimous All-American and Big 12 Player of the Year, she also averaged 8.3 rebounds and shot 58.4 percent from the field. "Just ending it on a loss is kind of hard to swallow right now," said the 5-11 Davis following the Elite Eight game. "But when you really think about it, we really did have a great season. Everything's cloudy right now, but a week from now, a month from now, I'll be able to see the better picture. We made it to an Elite Eight, and a lot of people didn't think we would be here." The key, though, was the Lady Bears getting contributions across the board. Junior point guard Niya Johnson averaged a national-best 8.9 assists; Wallace and sophomore guards Alexis Prince and Imani Wright combined to knock down 120 3-pointers; and 6-4 senior post Sune Agubke (see feature on p. 22) was the low-post enforcer, averaging 6.5 points, 6.1 rebounds and 2.1 blocks per game. "There's just not another group of girls that I'd want to go to war with," said Agbuke, who is finishing her first year of law school. "I'm excited for them, because next year they'll be better and the year after that they'll only get better. That's the kind of program that Coach Mulkey has built here. This year, we made it to the Elite Eight, and we're disappointed because we couldn't make it further. But next year, man, they're going to be great." After losing a pair of NBA-prospect big men, the expectations for Drew's Bears were barely a blip on the radar. At least outside the program, the forecast couldn't have been much worse. But what the outsiders couldn't see was the development of 6-9, redshirt freshman forward Johnathan Motley and 6-8, 280-pound junior forward Rico Gathers, a first-team All-Big 12 pick who averaged 11.6 points and ranked fourth nationally with 11.6 rebounds per game. "You always know what you're going to get with Rico," Drew said. "His conditioning really improved to where he could play a lot more minutes, and then obviously his skill level has gotten a lot better. He's worked hard on his game, and it shows." Another key was the 6-7 Prince accepting a bench role. 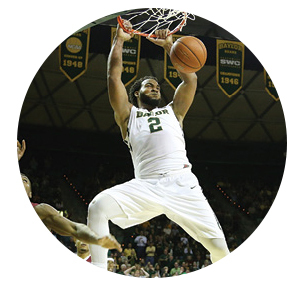 Earning the Big 12 Sixth Man Award, Prince averaged 13.9 points and 5.6 rebounds and hit a team-high 60 3-pointers. "Today, a lot of people get caught up in the hype and who's starting," Drew said. "But TP wants to help the team in any way. He came off the bench and was successful and the team was doing well, so he bought in 100 percent." Drew also relied on the senior leadership, on and off the court, of Chery and 6-6 forward Royce O'Neale. They also carried their share of the scoring load, averaging 11.3 and 10.1 points, respectively. This team, more than any of Drew's previous 11 editions at Baylor, shared the ball and played unbelievable defense. They were one of just four NCAA Division I teams to hold every opponent below 75 points, allowing just 60.2 points per game and a 40.2 field goal percentage. "We model ourselves after the Spurs," Gathers said. "They play basketball like it's a musical out there. That's the type of players we like. We have guys who ball-fake, pass it. They'll pass it right back to the person who just ball-faked it to get him open. We focus on the 'we' aspect instead of the 'me' aspect." The Bears won at Iowa State for the first time in school history, swept three games from a West Virginia team that made it to the Sweet 16, finished in the top half of the league and earned an NCAA Tournament bid for the second season in a row and fifth time in eight years. What had been such a magical, implausible season for four months came to a screeching halt when Georgia State's R.J. Hunter nailed a 30-foot shot with 2.8 seconds left in a shocking 57-56 loss to the 14th-seeded Panthers in a second-round game in Jacksonville, Fla.
"These guys did a phenomenal job all year long from the standpoint that at the beginning of the year we weren’t supposed to be here," Drew said. "Unfortunately, we had 2 and a half, 3 minutes of bad basketball that was uncharacteristic. And because of that, it puts a real sour taste in everyone's mouth for how the season ended. At the same time, you look at the body of work, and I couldn't be more proud of what these guys have done for our University and how they represented our program."